The reconstruction of the palace, that had been destroyed during World War II was completed in summer 2000. Now the splendor of Sayn Palace (Schloss Sayn) is restored. 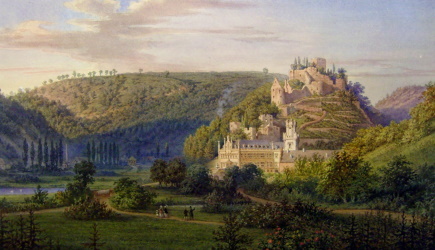 Together with the castle hill and the park the neo-gothic residence of the Princes of Sayn-Wittgenstein-Sayn is the centerpiece of a romantic ideal landscape. Inside, a museum has been created, where the visitor can see a multitude of artifacts from the times when Sayn was famous for it’s ornamental cast iron (Kunstguss). 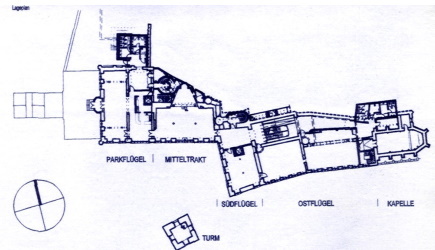 The adjacent Chamber of the Princesses offers an insight into the history and life of 6 generations of Princesses Sayn-Wittgenstein and their children. One floor above, one can visit several staterooms, salons and cabinets, furnished with precious paintings, furniture and artifacts remaining from the original interior decoration. The palace also offers rooms for banquets and modern conference facilities. The palace chapel with its famous Moritz von Schwind windows has been restored in its neogothic beauty and is open to the public for celebrations and weddings. In the near future the outside staircase is to be reconstructed in order to allow the visitor to pass directly from the park to the terrace and the restaurant. New: Here you find a print-out-guide for Sayn Palace!